As the founder of a line of outstanding 19th-century Spanish artists, José de Madrazo y Agudo is one of the great names in Spanish neoclassicism. His work, his preeminent position in Spanish society and his deep influence on many generations of painters trained at the Academy of San Fernando make him a fundamental figure of this period. After preliminary studies in Madrid with Gregorio Ferro (1742-2812) Madrazo received a stipend from King Charles IV in 1801 to visit Paris. His countryman, politician Pedro Cevallos, had been instrumental in this process, which allowed him to study with Jacques Louis David (1748-1825). Madrazo’s appreciation of the classical world blossomed under his new teacher, with whom he continued to study until 1803. 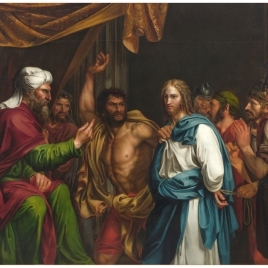 That year, he made one of his most David-inspired works, Jesus in the House of Annas (P3912), which was so appreciated at Court in Madrid that his stipend was extended to cover a period in Rome, where he had contact with Ingres (1780-1867). A year after his arrival in Rome, he painted The Death of Lucretia, which is also neoclassical. There, Madrazo planned an ambitious art project consisting of a cycle of large canvases on ancient history. In fact, he painted only one of those works, The Death of Viriatus, Chief of the Lusitanians (P004469), which exemplifies his admiration of models from Greek Antiquity. Almost certainly the best-known Spanish neoclassical painting, this work soon became one of the great icons of patriotism and freedom—a role favored by its permanent exhibition at the Museo del Prado since its inception. In 1808, Madrazo was imprisoned for his loyalty to Charles IV (against Bonaparte), and to maintain himself without the stipend he had previously received, he began painting portraits of Spanish and international aristocrats living in Rome. 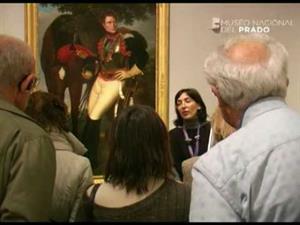 Those paintings reflect his familiarity with Ingres, especially the outstanding Princess Carini (Community of Madrid). In 1813, while still in Italy, he was appointed to the Academy of Saint Luke, and painted Divine and Profane Love (P06951), in which he softened his neoclassical language in favor of more traditional academic formulas. In 1818, following the death in exile of Charles IV and his wife, Marie Louise, Madrazo returned to Madrid and assumed the posts of royal chamber painter and academician at the Academy of San Fernando. From then on, his artistic career was linked almost entirely to portraiture, although he also made a few history paintings, including the Assault on Montefrío by El Gran Capitán (Segovia, Alcázar), from 1836. Among the portraits he made after returning to Spain, Ferdinand VII on Horseback (P3295), from 1821; and the Romantically inspired Manuel García de la Prada (1827, Madrid, Academy of San Fernando) stand out for their significance and iconography. Madrazo’s social visibility and standing grew rapidly from the time he returned to Spain as a result of his relations with the market of antique art and the launching of the Royal Lithography. At the Royal Academy, where he was professor of painting and assistant director, he carried out an ambitious project to update teaching methods. These efforts took almost two decades to bear fruit, due to opposition from that institution’s most conservative sectors. His institutional career culminated in his appointment as first chamber painterfollowing Vicente López’s death in 1850. That same year, he also became director of the Museo del Prado, a post he resigned shortly before his death (G. Navarro, C. in: El siglo XIX en el Prado, Museo Nacional del Prado, 2007, pp. 477-478). His self portrait at the Museo del Prado is cataloged as P04470.